The day after I wrote about the suspicious nature of the attack on Dr Fox, I found greater reason for worry in the fuel Channel 4 was adding to the fire. Jon Snow had tweeted ‘Amid morass of Fox/Werrity: the Sri Lankan aspect builds’. He claimed too that ‘we shall have more today from the same high up SL source’. The other principal suspect as to undue influence of the Tiger rump on British media, Jonathan Miller, said tweeted ‘Sri Lankan sources tell C4 news Werritty discussed arms deals in Colombo’. 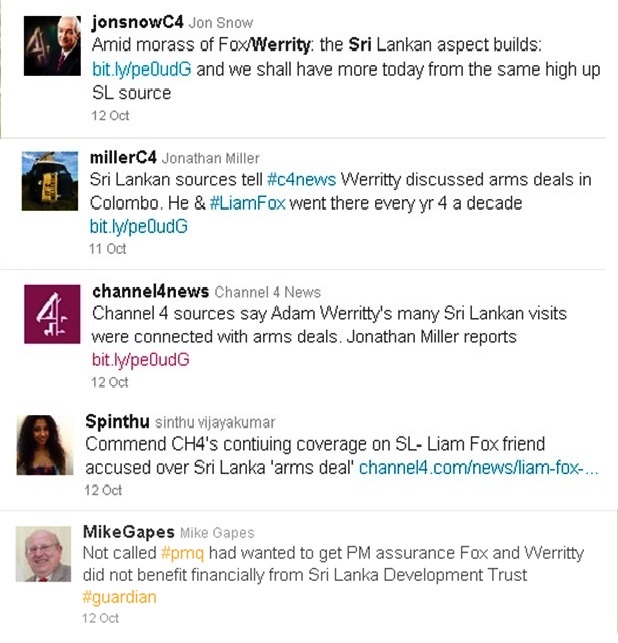 Needless to say Channel 4 itself got in on the act with ‘Channel 4 sources say Adam Werritty’s many Sri Lankan visits were connected with arms deals. Jonathan Miller reports’. 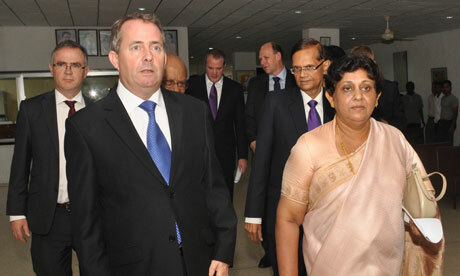 Needless to say this was taken up, for instance by a Sinthu Vijayakumar who ‘Commend CH4’s continuing coverage on SL – Liam Fox friend accused over Sri Lanka ‘arms deal’. The comparatively civilized but nevertheless anti Sri Lankan MP Mike Gapes had noted a question ‘to get PM assurance Fox and Werrity did not benefit financially from Sri Lanka Development Trust’. The next day however all this seemed to have died down, perhaps because Snow did not get what he wanted from his ‘high up’ Sri Lanka source. 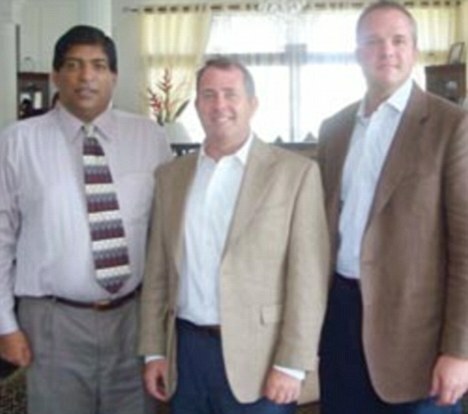 We did see a picture in the ‘Independent’ of Ravi Karunanayake, described as a diplomat, with Fox and Werrity, and I would presume that had been provided by Ravi himself, since I would be surprised if the ‘Independent’ kept a bank of pictures of him with the several politicians he has been photographed with over the years. But by and large the press seemed to have moved to other matters with regard to Liam Fox, and Sri Lanka did not loom large as Channel 4 had predicted the day before. That does not mean they will abandon their Fox Hunt, and I am sure the Sri Lankan connection will be recycled again before long. The ‘Times’ meanwhile also predictably weighed in with an editorial dedicated to Fox and Sri Lanka. Natually it got several things wrong. It claimed Fox had negotiated ‘a deal between Sinhalese authorities and insurgent Tamils’, when what he had done is developed an understanding between rival national political parties, which it was hoped would facilitated negotiations with Tamil parties. The Times also characteristically puts all Tamil separatists into the terrorist basket by claiming that they used brutal tactics, and then claims that the actions of our armed forces in response was ‘grotesque and criminal’, terms they do not use in cases in which it would be impossible to argue that collateral damage was proportional. The editorial ends with the categorical assertion that the Sri Lankan government ‘has committed war crimes’, of a piece with the grotesque if not criminal manner in which the ‘Times’ claimed we had inflicted thousands of civilian casualties, a claim for which it advance three different and contradictory sets of reasons in May 2009. Looking through the further coverage by the ‘Times’ of the Fox case, we can see similar sleight of hand. Perhaps this is not deliberate, for elsewhere too I see some confusion with regard to Werrity’s position before Fox became Defence Secretary, and afterwards. While I can see it is wholly inappropriate for someone to describe himself as Adviser to a Cabinet Minister, a position which doubtless provides for official advisers, I would suggest there is a difference with regard to such a claim when no official responsibilities are involved. The Defence Secretary is in a position to influence and indeed make national policy, and to commit national funds, so circumspection is vital. However, when one is without such responsibilities, I see nothing wrong in relying on competent and knowledgeable friends. Whether Werrity was such is not up to us to judge, but thus far no evidence has been adduced to suggest that he was responsible for Fox doing or saying anything inappropriate. 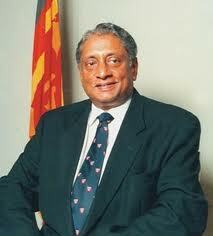 Lakshman Kadirgamar - twice Minister of Foreign Affairs of Sri Lanka, assassinated by an LTTE sniper in August 2005. The Times also has an article about several trips Fox made to Sri Lanka, though it notes that the occasions on which he was a guest of the Sri Lankan Government were before the election which brought him ministerial office. Of course the real animosity of the Times lies in the fact that he was planning to go to Sri Lanka last December, to deliver the Lakshman Kadirgamar memorial lecture, at a time when the rump of the Tiger terrorist movement had managed to stir up feeling in Britain against Sri Lanka, on the occasion of President Rajapaksa’s visit to address the Oxford Union. I still cannot understand why the former High Commission in Britain encouraged that visit, when her successor and his staff (and indeed Bell Pottinger) had advised against it, and indeed came over with the President and took charge of the occasion. It is possible that, as earlier, when the British Foreign Office was intriguing against us in Geneva even while the Defence establishment was cooperating to limit terrorist funding, she took as unlimited goodwill what was positive only upto a point. But the fact remains that those who had financed terrorism derived a new impetus from those events, and now knew that the funds they had were most usefully employed in denigrating Sri Lanka’s name. In such a context, Fox reminding the world of the Tamil Foreign Minister whom the Tigers had so ruthlessly assassinated had to be prevented, and unfortunately the British establishment played ball. However they obviously concurred with Fox’s recent visit to deliver the lecture, and I believe the much more positive approach of the current British High Commissioner to Sri Lanka, as opposed to the old Miliband approach, has helped in normalizing relations. But this the Tiger rump would have seen as a red rag to a bull, which I suspect explains the initial attack on Fox, and the provision of a picture from his Sri Lankan visit to the press. When that led to concerns in other areas, such as visits to Dubai and work with Israel, the Tiger rump would have been delighted, since they would be happy to eliminate Fox, whatever the reason. But it is interesting that their votaries, Jon Snow and Jonathan Miller, keep harping on the Sri Lankan connection. While obviously they would not want the British public to know of their role in the toppling of Fox, they also need to keep the Sri Lankan rationale alive. Hence the Times editorial on top of the Channel 4 effusions – with further evidence of connivance provided when representatives of the Times and of Channel 4 turned up together at the meeting in the House of Commons to which, entirely falsely, the Tiger rump had attempted to link Fox as well as Bell Pottinger. One final irony in the whole business should be noted. Some commentators are trying to insinuate some sort of sexual relationship between Fox and Werrity. Several months ago the Foreign Secretary was in trouble for sharing a room with one of his aides, who had subsequently to resign. Soon after the coalition government was set up, a very capable Minister had to resign because it seemed he had made inappropriate claims about expenses because of a boyfriend, in an effort to protect his mother from the truth about himself. Many years ago, in discussing Paul Scott’s brilliant Raj Quartet, I noted the trope he used for the negative aspects of British imperialism, in introducing the character of Ronald Merrick, the repressed sadistic homosexual. I wrote then that this seemed a bit unfair to the British, since not all of them were repressed. Seeing the strange dance going on in the press about senior politicians of great capacity, whose room for maneuver is limited by gossip when it does not altogether ensure their removal, I wonder how Paul Scott would have dealt with this new manifestation of the death of liberal England.